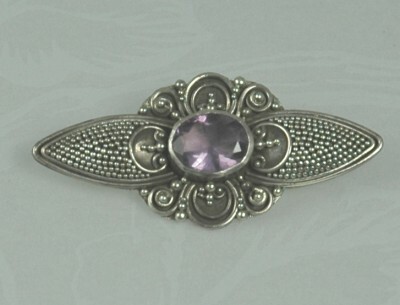 SOLD Marked 925, this pin is lovely and so elegantly designed. A bezel set amethyst that although I am not a gemologist, I believe is real due to several factors. When viewed with a loupe, the stone has zoning and seems to be doubly refractive. The cut of the stone is also not perfect; leading me to believe it is a real amethyst. At any rate it sparkles and sits slightly above a fancy floral pattern. I did not polish the sterling, however I will upon request. Condition: Excellent vintage. Unpolished, great patina! Measurements: 1 1/2" wide and 3/4" long measured at the center.